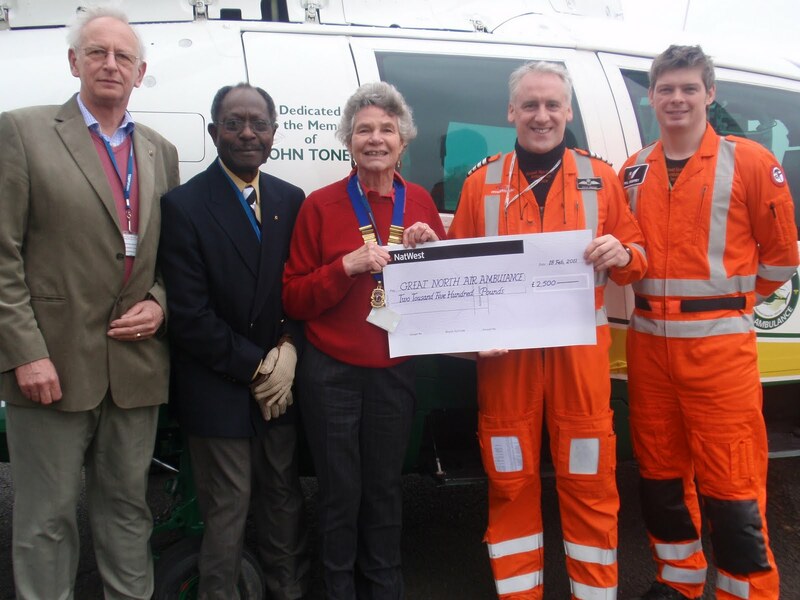 Lions' Joint President Muriel Sobo, secretary John Morris and Lion Yomi travelled to Durham Tees Valley Airport where one of the two helicopters is based to present a cheque for £2,500. They were hugely impressed by the set up, warm airside offices on a cold day, computers linked to up-to-the minute details of the land-based ambulance service and medical personnel and a pilot all kitted up, ready to go at a moment's notice. The Air Ambulance helicopters, the other one is based at Penrith, can travel at 200mph and journeys from pick-up to hospital are covered in less than 25 minutes. The area they cover is huge, up to the borders, down to Yorkshire and coast to coast. With 1400 calls a year and each one costing £2,500 they were pleased to receive our help. The money was raised at the Lions' Swimarathon, mainly by Ponteland Middle School and Ponteland Swimming Club, with help from other sponsored teams from the schools and clubs of Ponteland. Thanks to all swimmers, sponsors and organisers!